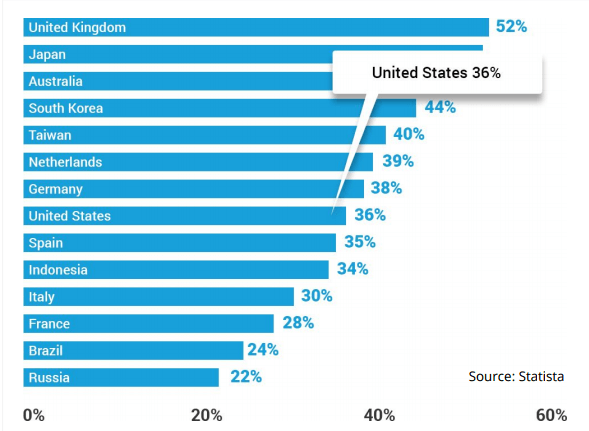 The U.S. is an ecommerce hotspot for growth-minded international online sellers. It’s a global leader when it comes to cross-border ecommerce exports and imports. On top of that comes a huge purchasing power, advanced technologies and pure love for online shopping. 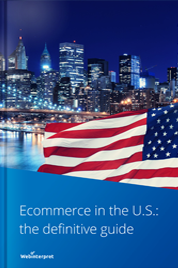 Interested in more ecommerce facts, figures and trends for the U.S. ecommerce market? Read more and check out our comprehensive report! If you were to name the land of opportunity, what would be the first country to come to mind? It’s likely that your answer would be: the United States of America. Despite the new leadership and some recent political events that tend to spark social media reactions and inspire funny viral memes, the U.S. has a history it can be proud of. It was centuries ago when the concept of the American Dream was born. Thus, America has become the land of opportunity and a synonym for equality, success and friendly, happy people: confident, go-getting and embracing their freedoms. America is also the land of opportunity and a superpower in the world of online sales. It has the world’s largest economy and it’s a global leader when it comes to cross-border ecommerce exports and imports. It’s the birthplace of ecommerce giants, such as eBay and Amazon. On one hand, the U.S. is a mature marketplace whose growth may possibly slow down in the coming years. 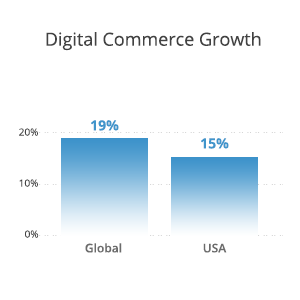 On the other hand, U.S. ecommerce sales still lead the Western world. America’s market size, purchasing power, advanced technologies and pure love for online shopping make it an ecommerce hotspot for growth-minded online sellers. 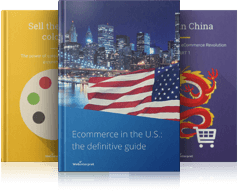 If you’re interested in comprehensive, quality data about ecommerce topics of your interest, we have some free guidebooks and reports to help you maximize your sales! The U.S. is the third largest country in the world and twice the size of the EU. It’s one of the world’s largest consumer markets with high internet penetration. It’s also the leader in the latest technological releases and innovations. Amazon is the dominant retail ecommerce platform in the U.S. and one of the country’s top five digital properties overall. The power and strength of America entice many foreign businesses to give into the temptation to enter this market, despite the expectedly high entry barriers and strong competition. 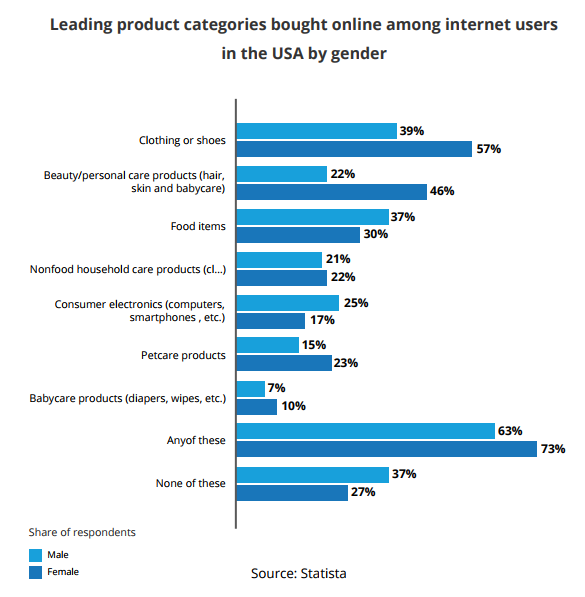 The U.S. is comprised of savvy, internationally-minded consumers who are well-acquainted with online shopping. U.S. millennials (18-34 year olds) and females are most likely to buy digitally. Customer satisfaction and confidence levels are relatively high in the U.S., but so are customer expectations. To a large extent, the U.S. is similar to European marketplaces and European consumer behaviour. The heaviest consumption takes place over the holiday season. 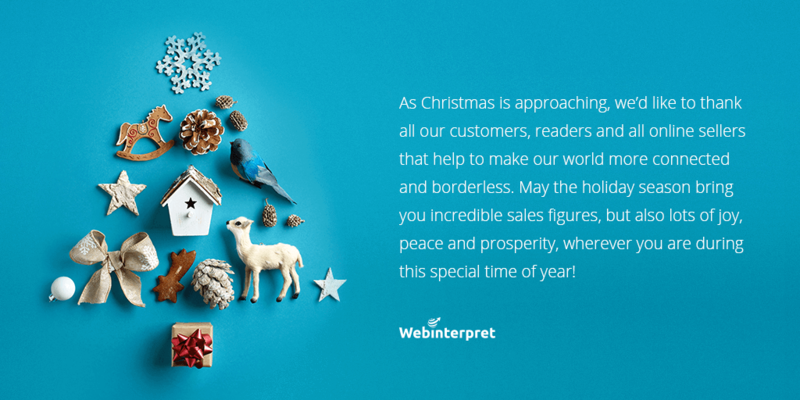 It’s worth remembering the days of the year when U.S. businesses offer big sales deals, e.g. Black Friday, Cyber Monday and holiday periods. These are the times when you can sell much more than during the rest of the year. According to a Pew Research Center survey (2016), about 8 in 10 Americans are online shoppers. 79% have made an online purchase of some type. Roughly 1 in 10 U.S. adults have shared their opinions about products or companies on social media. Hence, customer experience and the importance of customer reviews mustn’t be underestimated. It may seem like a given, but don’t forget cultural differences, especially when it comes to communication. You may think: But it’s obvious, we all know American culture! Granted, we know films, pop songs and other aspects of American culture. Yet it doesn’t mean that the actual business interaction with Americans will be something you’re familiar or comfortable with. Many cultural subtleties can be easily overlooked, especially when it comes to everyday business communication and the tone of voice. 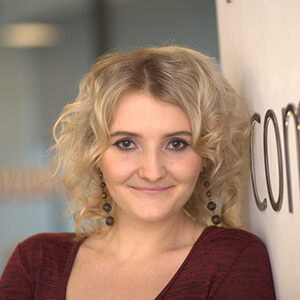 Increased awareness of such cultural differences will help you adapt to any foreign market. This way, you’ll be able to increase your chances of business success, not only in the U.S. but also in other countries. beauty / personal care products. The U.S. is a large country that boasts high-performance rail networks, highway connections and air-traffic systems. Its well-developed logistics market has strategic centres in excellent locations. The preferred shipping options in the States are UPS and FedEx. Small businesses may also use the government run postal system (U.S. Postal Service). As American consumers tend to be more impatient than those in other countries, most U.S. retailers offer free, and increasingly same-day, delivery options. However, the U.S. market is much bigger geographically in comparison to the UK so next-day delivery is not as commonplace as in Britain. Security: due to recent escalations in violence, the direct routes to Mexico and Texas have become more dangerous. Similarly, terror attack vigilance has made the U.S. extra careful in the case of goods flowing in. Economy: the impact of the recession in the U.S. has had a long-term effect in terms of job losses in manufacturing. Regulations: these have to do with paperwork, legislation and import/trade restrictions. Restrictions cover a number of products, including medicines, cheese, alcohol, food or explosives. Optionally: the link to the product and the Incoterms. Many companies offer delivery services to the U.S.. Yet bear in mind that it may take an exceptionally long time to deliver through the U.S.PS (U.S. Postal Service). Hence, Adrien recommends using companies that have daily and direct connections with local networks in another country. According to a survey by American Express (September 2016), the most popular payment method among U.S. digital buyers are cards. Credit cards are used for purchases by 73% of U.S. adult digital buyers and debit cards by 62%. 59% frequently used digital payments, e.g. stored payment cards, mobile wallet apps. 53% report using cash. American Express’s data refers to both online and offline purchases. Interestingly, many U.S. consumers are multiple cardholders with nearly five cards per adult. Mobile commerce in the U.S.
Based on the Statista data, the mobile share of retail ecommerce sales in the U.S. amounts to 36%. Even though the U.S. is a bit behind the UK (52%), which ranked first, its position is still strong. Mobile is becoming the ultimate ecommerce device. Ensuring proper mobile optimization and great mobile buying experience is a must for growth-minded online sellers. The U.S. is one of the largest cross-border B2C ecommerce markets when it comes to both exports and imports. 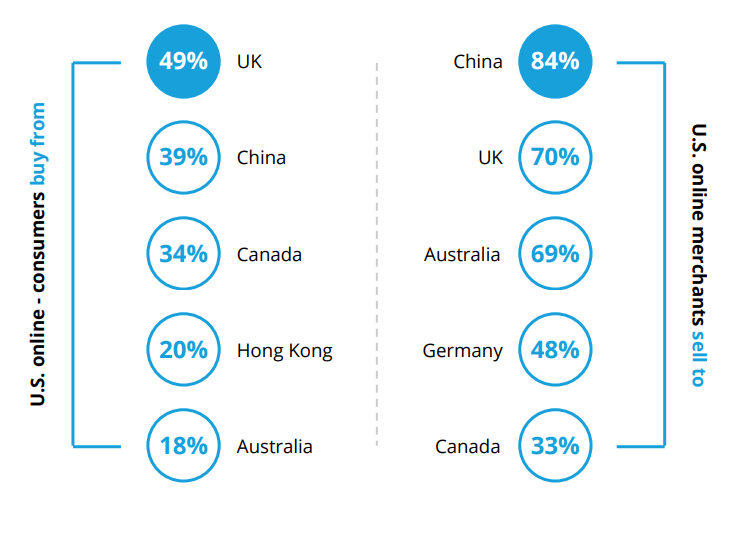 The most intensive B2C ecommerce trade between the U.S. and the UK is the result of the common linguistic background. A popular destination for online shopping is also China. More than a half of online sellers in the States sell to international online shoppers, often focusing on those based in Europe. Benefits of selling your products online in the U.S.
First, America speaks English: the world’s most popular second language and the most popular language online. No wonder that English-speaking marketplaces are the first choice after one’s domestic market! This gives you access to millions of buyers from the U.S. and beyond. The second benefit of selling your product in the U.S. has to do with the size and maturity of the market. This translates into access to a very, very large number of online shoppers. Further benefits include online savvy consumers, well-developed infrastructure and an advanced payment culture. Third, technology adoption is quick among the U.S. population, which gives online sellers a large number of marketing and communication opportunities, e.g. via social media or apps. Finally, consider the strength of the U.S. as a country and the notion of the U.S. ecommerce superpower. Many foreign businesses simply can’t help but target and keep the U.S. in their country portfolio. The market’s sales potential and its leading position seem to outweigh the initial burden of barriers to entry. you must face the challenges of strong domestic competition, changing demographics, rapidly transforming technology and high consumer expectations. Second, taxes in the U.S. are an exceptionally complex topic with many different state and local sales taxes. Interestingly, some online retailers don’t show the tax owed until the buyer reaches the checkout page. This move, however, may be very risky as a lot of consumers may, seeing unexpected extra charges, abandon the shopping cart. Third, when it comes to the U.S. infrastructure, challenges relate to the country size, the variety of landscape and the uneven concentration of population. Logistics challenges may especially affect smaller and mid-sized merchants. They may not have appropriate resources or may not be able to compete without becoming part of a larger distribution organization. This can make their margins suffer immensely. A few centuries ago, America made it possible for people of all backgrounds to pursue happiness in the newly-born country that became a synonym for possibility, opportunity and equality. How about online sales? Is America a promised land today? It’s definitely one of the key players and an ecommerce superpower with only one valid rival: China. The U.S. is a leader in cross-border ecommerce exports and imports. The market is full of potential and sales opportunities, e.g. during seasonal events, such as Black Friday or Cyber Monday. Even though it may be relatively difficult to enter the U.S. market and stay competitive, once in, your efforts may multiply your revenue and bring business success in a country with one of the strongest economies in the world. As they say: in America nothing is impossible.